This aggression will not stand, Discovery Channel. 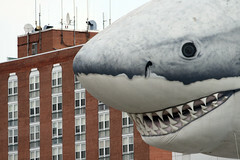 Sure, your fancy building Silver Spring employs hundreds, if not thousands, but until you reinstate the lovable inflatable Chompie the Shark, I’m not sure I can go along with your Shark Week Shenanigans. I remember when you used to mean something, Discovery, I remember when Shark Week was all about sharks eating things, be they people, boats, or other fish-like creatures, and I remember that it was all about a giant inflatable shark that you would decorate your building with. Seriously! What do I have to look forward to when the Metro comes up from Forest Glen, cell phone service? Whatever. Let’s burn Silver Spring to the ground!!!! No? Are we not there yet? Oh, these torches and pitchforks? No, not for a riot at all! They’re for …. farming? At night? Yeah, that’s the ticket!